“Groundhog Day” is back, this time on stage. Is it deja vu, or something new? Britain’s theater critics were largely enthusiastic Wednesday, the day after the show’s gala premiere, praising its zany fun and dynamic theatricality, and hailing star Andy Karl as a worthy successor to the movie’s leading man, Bill Murray. The musical’s script is by Danny Rubin, who cowrote the film and keeps it faithful to the spirit of the original. Composer-lyricist Tim Minchin and director Matthew Warchus are the team behind “Matilda The Musical,” the Roald Dahl-inspired show that won seven Olivier Awards and four Tonys. Like “Matilda,” it’s a bold, clever mix of cynicism and optimism, both tart and tender. Phil’s shock gives way first to hedonism and then to despair, as he realizes he is essentially immortal. One disturbing number shows his many and varied attempts to kill himself -- gun, knife, toaster in the shower. After each death he awakes as though nothing has happened. But while it flirts with the abyss, the show is often funny, and ultimately redemptive. Phil emerges transformed, like Scrooge in “A Christmas Carol” -- in this case by being shown the ghost of eternal present. Karl, who was Tony-nominated for the short-lived New York stage version of “Rocky,” gives an underlying boyish charm to a character who is basically a monumental jerk. 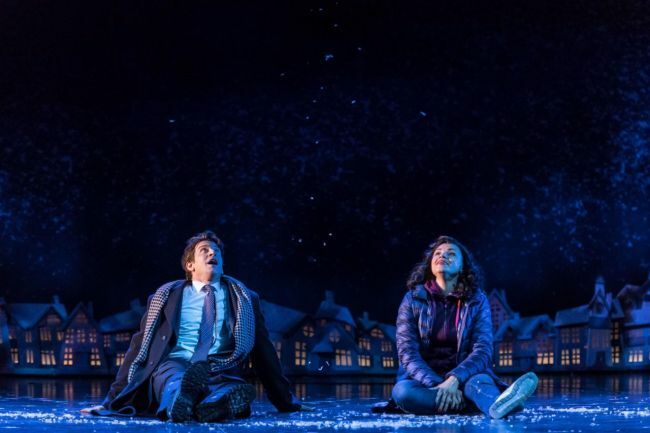 “Groundhog Day” runs at the Old Vic until Sept. 17 and was initially due to open on Broadway next year. But co-producer Scott Rudin pulled out of the project in June, leaving its New York future uncertain.